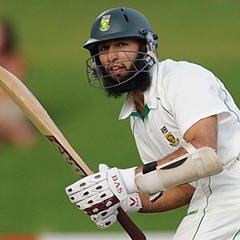 Cape Town – The serenity and the pure pleasantness, really, of his off-field personality is arguably Hashim Amla’s only “crime” if it is true that Australia believe they can unsettle him through sledging in the Test series starting in Brisbane on Friday. His genial nature, truly authentic humility and tendency to be soft-spoken perhaps give off a deceptive impression that there are some character flaws to his cricketing package; ones that could potentially be exposed in the hurly-burly of combat between the Aussies and their toughest southern hemisphere rivals South Africa. Amla’s astonishingly clinical, consistent and near-eternally resilient modern track record at the international crease, of course, only shows up the foolhardiness of that theory. It begs a further question, too: who exactly are going to be the sledgers-in-chief? After all, the 2012/13 Aussie ranks are still not nearly as ruthless and mean as when figures like Steve Waugh, Matthew Hayden and Shane Warne -- backed by the majestic weight of their own statistics in the five-day arena -- genuinely did ruffle certain callow figures at the crease with their controversial “mental disintegration” techniques. You could probably try to entrust the task to veteran personnel like the fire-in-the-belly Ricky Ponting, or Mike Hussey, or maybe the sometimes snarling, grimacing senior quick bowler Peter Siddle. But to varying degrees, players like these may be more preoccupied these days by trying to ensure their own continued presence in the first XI of a country still in a tricky transitional phase at Test level. The boot may even be comfortably on the other foot, if you think more deeply about it, in terms of which team may have more success in this series for verbal distraction. Let’s not forget that Amla, eventually, graduated (with honours!) from a school of early but instructive knocks ... like when he was selected as a raw Dolphins player in the 2004/05 series against an England team of Duncan Fletcher’s coaching heyday. The young Amla was roughed up and technically exposed at Kingsmead (where he registered one and nought on his home-town pitch) and Newlands by the likes of throat-seeking Steve Harmison, Andrew Flintoff and Simon Jones. Understandably at the time, there were people who feared he would never cut it, and that those “wounds” might be too severe to repair. But all Amla has done subsequently is blossom, and at ever-gathering speed. Aged 29 and in pretty much the prime of his professional career, there seems no good reason at all to suspect that he will enter this particular series with personal trepidation. It is his second tour of Australia, and although he did not register a genuinely big ‘un during the historic 2008/09 triumph, he could be said to have “got in” in every one of his six innings. His scores were 47 and 53 at Perth, 19 and 30 not out at Melbourne, and 51 and 59 at Sydney. Those who have watched Amla only crank up his quest to be the primary Proteas dominator at the crease more recently, will be tempted to brand that series performance quite un-Amla-like, given his rare failure to translate at least one of those “starts” into a really bulky, three-figure vigil. The portents look good for him to set that right this time around, whatever the talk of pacy, gung-ho surfaces at the Gabba and the WACA – remember that Amla is an infinitely better bobber and weaver against shock bowling than in his earliest Test days and even brings out an occasional pull or hook now as a counter-strike tool. Nor is it as though Amla is yet to savour the century feeling against these foes: only last season, on South African soil, he registered successive tons – second-innings ones, too, which can often be of even greater value – at Newlands and the Wanderers in the squared, criminal “mini-series”. His Test average (currently just a shade under 50 at 49.95) only swelled robustly in England earlier in the year, where his South African record score of 311 not out at The Oval and later 121 at Lord’s are etched firmly in Proteas enthusiasts’ memory banks. The right-handed accumulator, always powered at least to an extent by a staunch religious faith to accompany his natural batting conviction, has amassed 4 946 Test runs in 108 innings, so if he compiles 54 runs in Brisbane he will be assured of becoming second-fastest South African, behind Herschelle Gibbs (108th knock), to reach the landmark of 5 000. Amla’s captain, Graeme Smith, is the current second-placed Proteas batsman, having got to the figure in 111 innings. No, while appreciating the danger of being made to eat my words, I would suggest that the Baggy Greens tear up their (allegedly) intended HM Amla script and quickly try to concoct a Plan B? *Follow our chief writer on Twitter: @RobHouwing. He will also provide daily comment on the Test series.